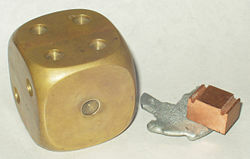 A decorative brass paperweight (left), alongside samples of zinc and copper. Brass is the term used for alloys of copper and zinc. It has a yellow color, somewhat similar to gold. The proportions of zinc and copper can be varied to create a range of brasses, each with unique properties. By comparison, bronze is principally an alloy of copper and tin. Despite this distinction, some types of brasses are called bronzes. Brass is relatively resistant to tarnishing and is often used for decorative purposes. Its malleability and acoustic properties have made it the metal of choice for brass musical instruments. It is also used for plumbing and electrical applications. Brass has been known to humans since prehistoric times, long before zinc itself was discovered. It was produced by melting copper together with calamine, a zinc ore. During this process, the zinc gets extracted from the calamine and mixes with the copper. Pure zinc, on the other hand, is too reactive to have been produced by ancient metalworking techniques. Brass has higher malleability than copper or zinc. The relatively low melting point (900–940 °C, depending on composition) of brass and its flow characteristics make it a relatively easy material to cast. By varying the proportions of copper and zinc, the properties of the brass can be changed, allowing the production of hard and soft brasses. Aluminum makes brass stronger and more corrosion resistant. It forms a transparent, self-healing, protective layer of aluminum oxide (Al2O3) on the surface. Tin has a similar effect and finds its use especially in seawater applications (naval brasses). Combinations of iron, aluminum, silicon and manganese make brass resistant to wear and tear. Today, almost 90 percent of all brass alloys are recycled. Brass scrap is collected and transported to the foundry where it is melted and recast into billets. Billets are later heated up and extruded into the right form and size. Based on its attractive color and resistance to tarnishing, brass is used for making decorative items. Given its malleability and tonal qualities, it is used for brass musical instruments such as the trombone, tuba, trumpet, and euphonium. Although the saxophone is classified as a woodwind instrument and the harmonica is a free reed aerophone, both are also often made from brass. In organ pipes designed as "reed" pipes, brass strips are used as the "reed." Brass is also used for plumbing and electrical applications. A well-known alloy used in the automotive industry is 'LDM C673', where the right combination of manganese and silicon lead to a strong and resistant brass. The so-called dezincification-resistant (DZR) brasses (brasses that resist the leaching out of zinc), such as alloy 'LDM G563' (brand name 'Enkotal'), are used where there is a large corrosion risk and when normal brasses do not meet the standards. Applications with high water temperatures, presence of chlorides, or deviating water qualities (soft water) play a role. DZR brass is excellent in water boiler systems. This brass alloy must be produced with great care, with special attention placed on a balanced composition and proper production temperatures and parameters to avoid long-term failures. Drunen, Netherlands, has the only active production facility that makes these high-grade brass alloys. Brass can be used for cryogenic containers. It was used to make fan blades, fan cages, and motor bearings in many antique fans that date before the 1930s. Admiralty brass contains 30 percent zinc and one percent tin, which inhibits dezincification (leaching out of zinc) in most environments. Alpha brasses (Prince's metal), with less than 35 percent zinc, are malleable, can be worked cold, and are used in pressing, forging, or similar work. Alpha-beta brass (Muntz metal), also called duplex brass, is 35-45 percent zinc and is suited for hot working. Aluminum brass contains aluminum, which improves its corrosion resistance. Arsenical brass contains an addition of arsenic and frequently aluminum, and is used for boiler fireboxes. Beta brasses, with 45-50 percent zinc content, can only be worked hot, and are harder, stronger, and suitable for casting. Cartridge brass is a 30 percent zinc brass with good cold working properties. Common brass, or rivet brass, is a 37 percent zinc brass, cheap and standard for cold working. DZR brass is dezincification-resistant brass with a small percentage of arsenic. High brass, contains 65 percent copper and 35 percent zinc, has a high tensile strength and is used for springs, screws, rivets. Low brass is a copper-zinc alloy containing 20 percent zinc with a light golden color, excellent ductility and is used for flexible metal hoses and metal bellows. Naval brass, similar to admiralty brass, is a 40 percent zinc brass and one percent tin. Red brass is an American term for CuZnSn alloy known as gunmetal. White brass contains more than 50 percent zinc and is too brittle for general use. Yellow brass is an American term for 33 percent zinc brass. ↑ Engineering Designer, v 30, n 3, May-June 2004, 6-9. ↑ Machinery Handbook, Industrial Press Inc, New York, Edition 24, page 501. This page was last modified on 23 June 2016, at 15:12.